The head of the OAS pressured Venezuela to address its humanitarian crisis. WASHINGTON (AP) — The head of the Organization of American States added his voice Thursday to the chorus of international leaders stepping up pressure on Venezuela to address a humanitarian crisis and end a crackdown on opposition activists. Secretary General Luis Almagro urged governments in the 34-nation OAS regional block to "stay on the right side of history and defend people who are voiceless." Almagro called Thursday's special session to denounce what he considers serious impingements on the democratic order in Venezuela. Venezuelan Foreign Minister Delcy Rodriguez denounced the emergency meeting as a coup. She said Almagro was trying to overthrow the administration of President Nicolas Maduro, and exaggerating the situation in Venezuela. "There is no humanitarian crisis," she said. The meeting comes amid a worsening social and political crisis in Venezuela. A majority of Venezuelans now tell pollsters that they don't have enough money to buy groceries, and the country has been wracked by weeks of food riots and lootings. Hospitals do not have enough medicine, and crucial medical equipment like incubators and radiation machines are in increasingly short supply. Meanwhile, the opposition is trying to launch a campaign to recall Maduro, but the process has been marred by delays and official roadblocks. A majority of OAS countries agreed Thursday express support for dialogue in Venezuela, but there were few concrete proposals. 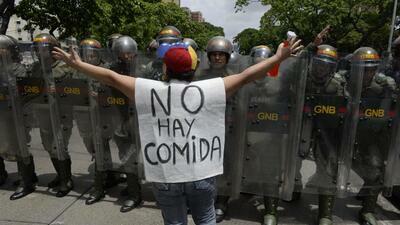 Pressure is mounting on Venezuela to make concessions. Top U.S. diplomat Thomas Shannon traveled to Caracas to meet with Maduro on Wednesday. Former Spanish Prime Minister Jose Luis Rodriguez Zapatero earlier this month attempted to mediate between the government and its opposition. But Maduro is doubling down on his existing approach to the opposition, and denouncing any country he believes is meddling in his country's affairs. The government brought charges against two more opposition activists this week, and officials have said the presidential recall referendum will not be held this year. U.S. lawmakers expressed support Wednesday for a mission to provide food and medicine to Venezuela. But the Maduro administration has said this kind of aid is not needed. When he called the meeting, Almagro invoked the OAS' Democratic Charter, a tool former President Hugo Chavez supported when it was approved 15 years ago to give the body a way to punish governments that became too autocratic. It was used to temporarily suspend Honduras after a 2009 military coup.